We began what Linda is referring to a Visitor Week in that we are happily connecting with some friends and family in different harbors this week. A sailboat + a bridge is always interesting. To get to Mystic, one must navigate a little way north up the scenic Mystic River before encountering both a swing railroad bridge and a bascule bridge. The RR bridge opens on request unless a train is approaching and the bascule bridge opens at 40 minutes past every hour (if there is waiting boat traffic). Since we were approaching on a Tuesday late morning, there was very little boat traffic which was good since although we had planned our timing well and followed the instructions from both the harbormaster and cruising guide, we happened to catch the RR bridge just as not one, but two trains were approaching. Thus we had to wait and circle for the first bridge quite a while unexpectedly, as well as then missing the carefully timed second bridge thus having to temporarily tie up for about a 45 minute wait. Despite the unintended delays, we really enjoyed the travels up the Mystic River and will return again (but this time we would arrive at the RR bridge earlier than needed in case there is a train closure). Close up view of the Mystic River Bascule Bridge - It is very well maintained and quite attractive. One can see the huge cement counterweights in the upper part of the photo. Josh and Sharon Visit the US! 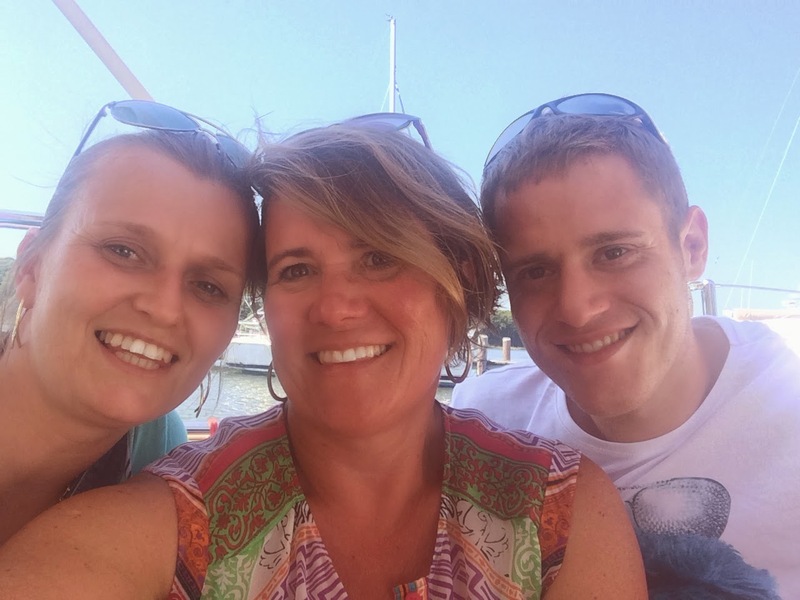 Linda's son, Josh, moved to Netherlands this past May to be with his love, Sharon. Both Josh and Sharon are spending a three week holiday in the Boston and New England area. We were thrilled to host them overnight while docked at Mystic Seaport before they spend a few days camping in Connecticut and visiting with friends and family. We look forward to seeing them again back in Boston at the end of our sailing trip. We are so proud of Linda's nieces Sam and Morgan. They are both embarking on terrific adventures. Sam has enlisted in the Navy and leaves for bootcamp in about 10 days; and Morgan starts her university career at SCSU this week. Congratulations Sam and Morgan!! Despite living in Connecticut for many years, Linda had never been to Mystic Seaport Museum before. We were not sure what to expect but thought it would be cool to be docked on the museum grounds, well museum waters. We loved it! The dockstaff was A+, we felt almost part of the museum with visitors passing by and some stopping to chat about the boat, and the docked guests have exclusive private access to the museum grounds after the area closes to the public in the evening. The town center is easily accessible by foot or dinghy. Among all the fun and adventure, we both are still working a bit also (Bob more so than Linda). 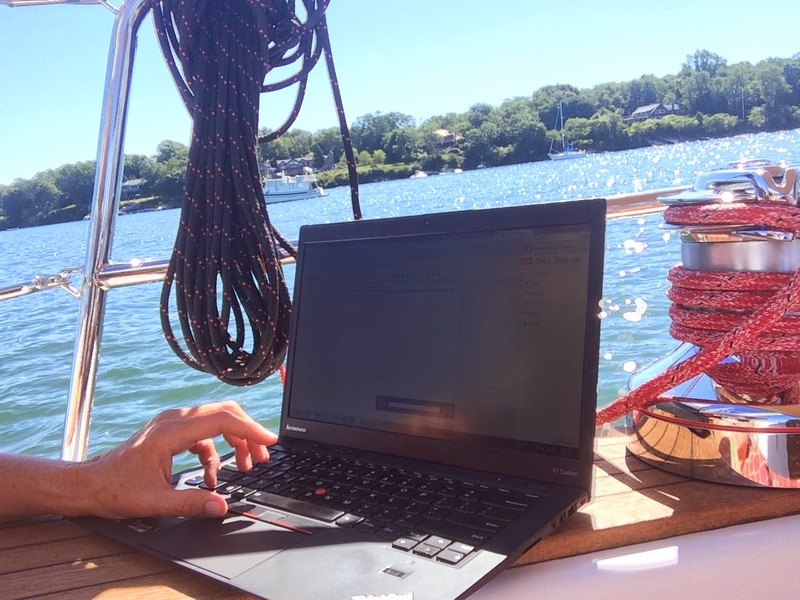 Wednesday of this week was one of our official, pre-scheduled working from boat (WFB) days. After a leisurely morning, we said farewell to our guests and headed south down the Mystic River not quite sure where our next destination would be. After examining the winds, currents and distances, we opted for Dutch Harbor on the west side of Jamestown RI. The wind was variable ranging between 8 - 20 kts but mostly out of the N. We used a few different sail trims including reefed main, then unreefed, jib, then genny, then back to jib. There was a high surf advisory for along the RI coast and we sailed in unusual swells in that they were sometimes 6 to 7 feet but with very long periods between thus still made for a comfortable ride. Given the height of some of these swells, however, we were sure to stay clear of the several shoals extending from the CT and RI coast. While in Mystic we ran out of propane as we were making our morning coffee. Not an issue as we have a spare tank and we quickly switched tanks. However, we soon were having difficulty keeping a full flame on any of the burners. Bob took advantage of Josh and Sharon having our car in Mystic and did some provisioning including taking our original tank to get refilled. This solved the problem but we do not yet know what the issue with the other tank is. We can address later. The bigger plumbing issue came up as Bob was doing dishes shortly after we anchored in Dutch Harbor - water pump seemingly died. Of note: our toilet uses fresh water, not sea water, hence there were implications and urgency all around with not having a functioning water pump. Although it is just the pressure switch we need, the following morning we were luckily able to secure an entire new water pump from Jamestown Distributors, a local extensive marine supply warehouse, and they will deliver the new pump this afternoon to the boatyard near where we are anchored. We will also send back this practically new water pump to the factory for a replacement (spare) or refund.